Our 1st PARENT Speaker Series is TONIGHT! We are excited to kick off the 2nd season of this successful program. Jane Hardin will be discussing Social Emotional Learning in the Home tonight, Thursday, September 13th at Milton High School. Ms. Harden will discuss ways to help parents and guardians navigate some of the social and emotional challenges that their children and adolescents face on a daily basis. She will offer strategies and provide concrete examples of how parents/guardians can develop constructive dialogues with their children in ways that foster essential social-emotional skills. The Department of Elementary and Secondary Education (DESE) has revamped their aMAzing Educators webpage, which features educators and now invites the public to share about their favorite teachers. This month, you can see teacher appreciation messages on 150 digital billboards statewide. I hope you’ll join me in recognizing the crucial role that teachers play in improving children’s lives and consider submitting an accolade about a special teacher in your students life. Chances are that you or your student have met some of the new additions to the Milton Public Schools staff. We have introduced them to their individual school communities and shared some photos here over the past two weeks. Please join us in welcoming the new staff at all 6 of our schools! There has not been a School Committee meeting since my last update. You can watch School Committee meetings (and other town meetings) at your convenience on Milton Access TV . The Milton School Committee has a Facilities Subcommittee chaired by School Committee Member Ada Rosmarin. One of Milton Public Schools Strategic Goals is to address our Facilities needs – in particular, how we may best address the increasing enrollment and space issues in our elementary schools. The School Committee would like to have one interested/available parent from each of our elementary schools on our Facilities Committee. The next meeting of our Facilities Committee is on Wednesday, September 26th at 5:30 pm at the Superintendent’s Conference Room at Milton High School. We will continue to meet throughout the school year. If you would consider joining this committee, please email Ada Rosmarin. The School Committee will be holding upcoming meetings in each of our schools, with the goal of involving more parents, touring each school and hearing the school’s Site Council Presentation. Please consider attending your own school’s date or another school that may interest you. 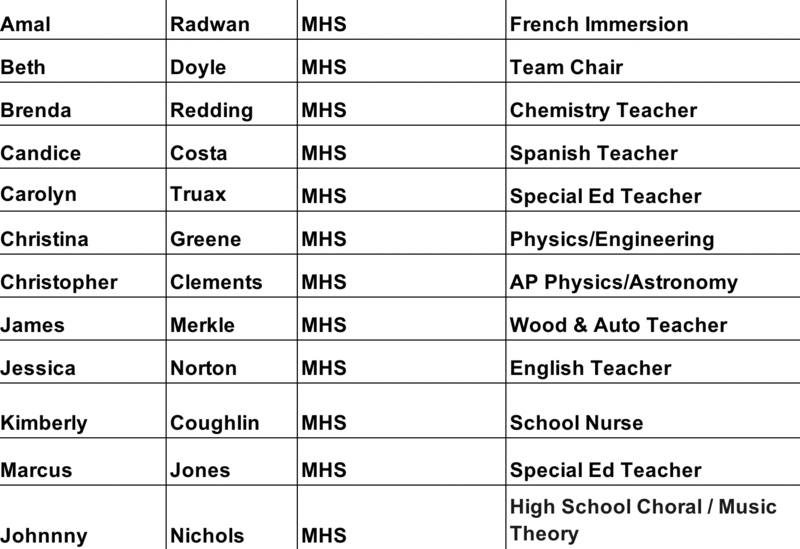 The dates are as follows: MHS October 17th, Glover November 7th, Cunningham January 23rd, Tucker February 27th, Pierce March 27th and Collicot May 15th. The School Committee is in need of a Secretary to the Milton School Committee. This is a stipend position and all details can be found here. Please email Charlene Roche with any questions. The school year is off to a great start at MHS. Please see our Club & Activity offerings this year and encourage your student to get involved! You can register here. 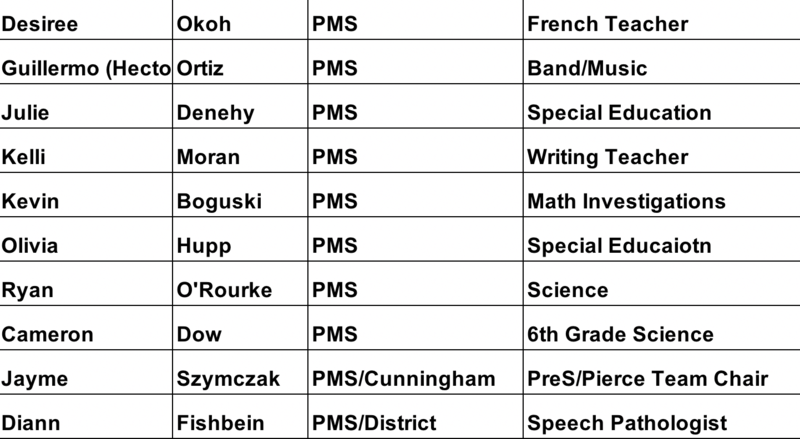 Pierce Clubs and PASS Classes have been announced and there are some terrific ones to check out. We hope to see many Pierce students trying something new this year! All MPS 4th graders participate in Future Problem Solvers as part of the 4th grade curriculum. Students learn a six-step problem solving process which they then apply, along with their research on specific topics, to solve social and global problems. A “future scene” prompts students to explore challenges as they refine their critical and creative thinking skills, focus on one problem area to solve, produce solution ideas, generate criteria to evaluate their solutions, and develop an action plan. In 5th grade and middle school, students are selected for 4 person teams to compete in FPS bowls.​ Our FPS teachers are Justine Novak and Anne Isabelle Jungels. We look forward to welcoming our new MPS 4th graders into the world of FPS and watching them blossom within this exciting curriculum. Great news for 4th grade students everywhere! 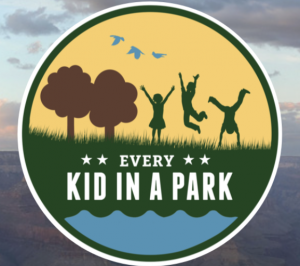 The federal Every Kid in a Park program has been authorized for another year, granting fourth-graders a pass for free access to all federal lands and waters. The pass is valid for the 2018-19 school year and covers one student and up to three accompanying adults — or an entire car for drive-in parks. 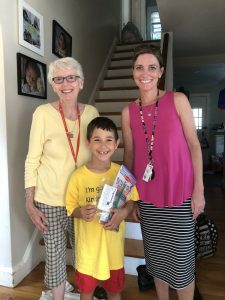 Nicholas is loving kindergarten at Tucker and as you can see was very happy to have his teacher, Mrs. Kostek, visit at home! Our Welcome to Kindergarten at MPS includes home visits, playdates, school visits, storytimes, Kindergarten Days, school orientations, welcome letters from teachers and more. 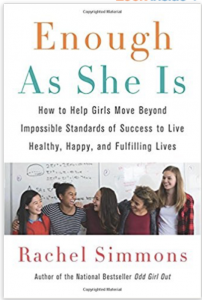 No el Vigue shares that Rachel Simmons (a popular speaker in last year’s PARENT Speaker Series) is offering an online course to moms, ‘Enough As We Are’ , in conjunction with her new book ‘Enough As She Is’. Registration is now open and the course starts September 24th. We think this is a valuable and relatable resource for parents/guardians and since we had over 550 participants come to see her in January, we wanted to share with the MPS Community. The MPS Adult Education Program is pleased to announce our exciting fall line up of classes. To register for all fall 2018 MPS Adult Education courses go to our website and pay online by Monday September 24th. All Course Descriptions may be found on our website. 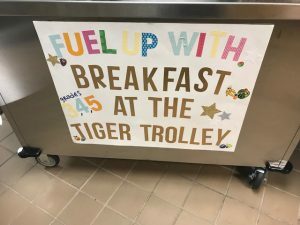 Last week we launched the new “Tiger Trolley” which is featured every morning on the third floor of the Tucker School. 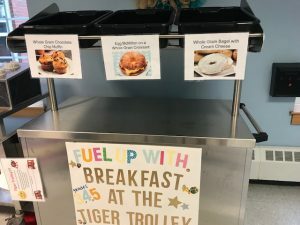 This new trolley is open to 3rd, 4th and 5th graders and students can choose from four selections each day for breakfast. 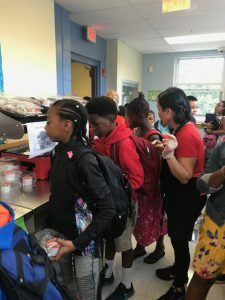 We are serving about 150 breakfasts to the Tucker students each day from the Tiger Trolley, in classrooms and in the cafe. 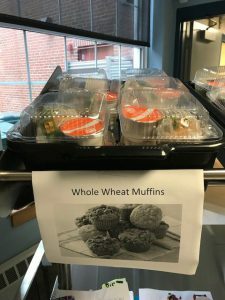 A huge thank you to our Tucker Food Service manager Kim DeMarino, our new breakfast cashier Zenaida Harvell and Sarah Evans our intern from Framingham State University for helping with this initiative. Our full day pre-k and 2nd grade students will continue with breakfast in the classroom and our kindergarten and 1st graders continue to enjoy breakfast in the cafeteria. Starting the day off right at Tucker! Registration for After School Enrichment has reopened. At any time, you can register by the last Wednesday of the month and start the first Monday of the following month. For more information, please visit the Community Schools website. It is an exciting time for some of our youngest scientists in the Milton Public Schools! Both kindergarten and 1st grade will implement three new units using the FOSS Next Generation Science kits this year. This week teachers at both grade levels received professional development on the units they will be teaching this fall. Teachers had the opportunity to learn about the curriculum and the many resources offered in the kits as well as online. 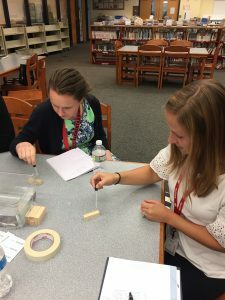 The professional development also highlighted the eight scientific practices and the importance of science notebooking. The most exciting part of the training was the opportunity for teachers to experience FOSS as their students will! 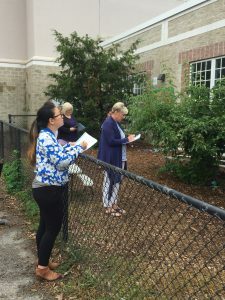 Teachers were able to go outside and observe trees in the outdoor classroom, draw conclusions about the different properties of wood, and make scientific sketches in notebooks. Throughout the “teacher as learner” experience, an emphasis was placed on scientific vocabulary and discussions. Grade level teams will reconvene in December to learn about their final unit. Would you like to have the Portal on your handheld device? Please follow the links below to add the ParentPlus or StudentPlus app to your device. Once you download the app you will need to click the green and white “+” . Enter your PlusPortal username (your email address used to log into the web version of PlusPortals). Select the first school you would like to add. Click “Register” in the bottom right corner. You will now be able to log into the ParentPortal app. If you have students at multiple schools, you will follow the same procedure to add another school. This starts by clicking the green and white “+”. Once on the app you will see Announcements, Alerts, Notifications and Calendar. If you would like to view homework, the directory, progress, emails, click the “hamburger” in the upper left corner of the screen. If you would like to view classes and schedule, click the graph in the upper right corner and the options will be displayed at the bottom of your screen. Pierce and MHS families can view progress and recent scores on this screen. Also a reminder that parents are able to update email addresses, phone numbers and emergency contact information at any time through Plus Portals. Log on to PlusPortals. Click on your student; click on school; click demographics; click edit; and click save. Mary Shapiro and Maura Middleton are the district’s Math Coaches. Elementary math coaches Maura Middleton and Mary Shapiro are excited for another year of working on mathematics education with K-5 teachers from across the district. Maura and Mary are looking forward to supporting teachers’ implementation of instructional routines that promote the Standards of Mathematical Practice, with a focus on encouraging students to look for and make use of structure. 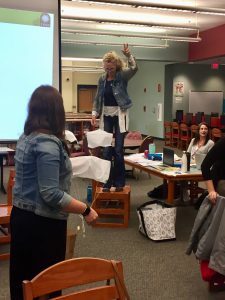 For example, two instructional routines that promote structural noticings are “Contemplate then Calculate” and “Number Talks.” The coaches initially introduced both routines to elementary teachers during a professional development day last school year. 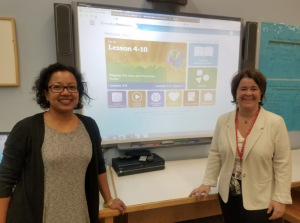 Mary and Maura will continue to coach teachers as they implement these instructional routines in their classrooms along with our Everyday Mathematics 4 curriculum. The coaches’ goals are to promote a growth mindset in mathematics, to increase students’ mathematical fluency and flexibility, to encourage student conversations around math, and to show students that mathematics is creative, open and visual. They look forward to another successful year of supporting the professional development of our teachers both inside and outside the classroom. MPS SEL Facilitator Laurie Stillman encourages you to take the time to attend our 1st PARENT speaker tonight, as it is Jane Hardin, a well respected professional in the education field. Ms. Hardin will be discussing how we, as parents and guardians, can support our children’s social emotional wellbeing which in turn bolsters almost every aspect of their lives. A healthy social emotional framework supports children across the board – with their school work, athletics, social interactions, organizational skills, etc. A new school year brings new routines and sometimes new challenges. This speaker may be just the boost your family needs to help facilitate a healthy and successful school year! 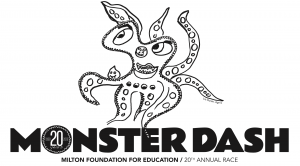 Halloween is around the corner, and once again the Milton Foundation for Education is looking for artwork to print on the front of race t-shirts for the Milton Monster Dash. Create your best design and submit one entry by Wednesday, September 26th. The winner will see their drawing on race t-shirts, and help start the runners on race day, October 28th. On Sunday, September 23, Caitlin Clavette’s family, friends, colleagues, students, and art enthusiasts will be running in a 5k road race in Milton to raise funds to support the Arts programs in the Milton Public Schools and to also sustain Caitlin’s passion for celebrating children’s creativity and individuality, the arts, and physical fitness. Caitlin was a Milton Public Schools art teacher who lost her life in a tragic car accident in February of 2016. The Caitlin Clavette Memorial Foundation, a licensed 501c3 corporation, was established in 2016 after this sudden and tragic event. Our goal is to continue Caitlin’s vision of supporting a community where all people support and appreciate the arts, respect and protect all living things, lead healthy lives through exercise and diet, and live with passion. The first 500 pre-registered runners receive t-shirts and the cost is $30 per runner with a family cap of $75. Beth Israel Deaconess Hospital-Milton will hold its ninth annual Walk for Wellness, Health Fair and Family Fun Day on Saturday, September 22, from 9:30 am – 1:30 pm at the hospital, located at 199 Reedsdale Road, Milton. The family-oriented, health and wellness event starts at 9:30 am with registration for a 5K or one mile walk which will start at 10 am from the hospital’s Highland Street Parking Lot. Visit the hospital’s website to download registration forms. Registration is $10 per walker, children under the age of 12 are free. The Milton Art Center has sewing, quilting, drawing, figure studies, pastels, clay, comics, animation, puppetry, screen printing, digital photography and more classes available for children and adults starting late September. Register now at our website. Food, fun, and football will be on the menu on Wednesday, October 17th, at Granite Links Golf Club as the Milton Library Foundation presents its annual gala to benefit the Milton Public Library. 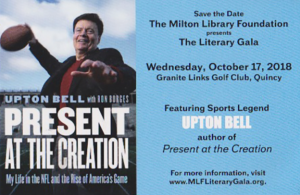 After music , hors d’oeuvres and dinner, legendary sports personality Upton Bell will regale the audience with some of the colorful stories contained in his book, “Present at the Creation: My Life in the NFL and the Rise of America’s Game”. The Gala will also honor the citizen volunteers who served on the Library Study and Building Committees leading up to the 2009 reopening of the Library. Tickets, along with sponsorship and advertising opportunities, can be found here. Brookwood Community Farm is a working farm located in Milton and Canton. Brookwood grows food sustainably for members through a community supported agriculture (CSA) model, provides on-farm educational and community-building opportunities, and actively supports food access projects. Fall CSA Shares are on sale now. The Fall CSA runs from September 25 to November 17 and Full Fall Share is $230 (pick up every week)while a Half shares for $128 (pick up every other week). The Fall Fruit Share is also available. The Full Share is $92 (pick up every week) and the Half Share $52 (pick up every other week). Milton Parks and Recreation Dept. Presents New England Championship Wrestling On October 13th to benefit the Parks and Rec Special Needs Programs. Get your tickets here. Volleyball is 5-0 after beating Needham 3-2 in a tiebreaker set last night! It was a fantastic match and they travel to Natick on Friday. Boys Soccer beat Braintree last week 2-1 to get their league play started! Sophomore Miguel Varela scored the game winner. Swim gets their season started tonight when they travel to Natick at Keefe Pool for a 5:30pm start! Milton High School is excited for the first home Football Game of the season. On Friday, September 14th at 7:00pm, our Milton Wildcats will be taking on the Presidents of Quincy High School. We welcome you to join us at Brooks Field at Milton High School and show your support for our ‘Cats! It’s a black-out! We ask all fans to try and wear black to the game. Our Wildcats are wearing red and Quincy will be in white. Our Cheerleading Team will be selling red glow sticks for $1 before and during the game. It is Youth Football Night, so Junior Wildcats will receive free admission if they wear their jersey to the game! Tickets are $5 for adults, and $3 for students & seniors. Children grades 5 and under are free as long as they are accompanied by an adult. We will not admit children grades 5 and under if they are not accompanied by an adult! Please no dropping off students at the gate. There will be no stopping at the crosswalk in front of the field. There will be no re-entry. Once you leave the stadium, you will need to buy another ticket to re-enter. Students are also encouraged to leave all bags in cars or their lockers. No bags will be allowed in the stadium. We also ask that you refrain from parking along the grass hill near the gate. There is plenty of parking in the back lots and the front lot of the high school. 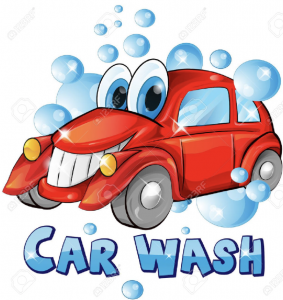 The MHS Baseball Team will be hosting a car wash fundraiser on Saturday, April 6th from 9am-12pm at the Cunningham School. $10 per car. 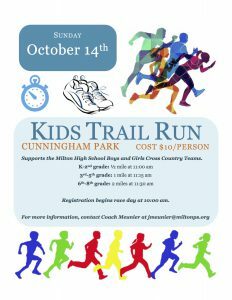 The Boys & Girls Cross Country teams are hosting their annual Kids Trail Run this year on Sunday, October 14th at Cunningham Park. SADD (Students Against Destructive Decisions) members at the MHS Open House on September 12th. 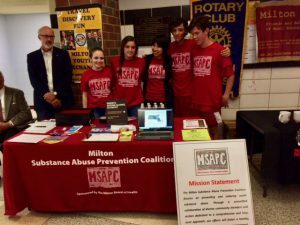 Students: Milton High School had a perfect season last year – not just on the courts or athletic field, but in a county-wide competition organized by Norfolk DA Michael W. Morrissey to support peer leadership and discourage youth substance abuse. 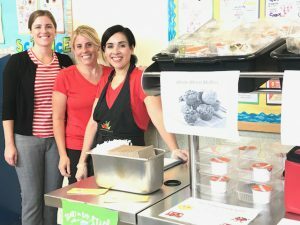 The competition, dubbed “Team Rival,” pits local high schools against their traditional athletic rivals to encourage participation in a series of constructive events and functions that are designed to build a school culture around healthy choices. DA Morrissey’s objective is to identify, support and help the students in each school who lead by example. Team Rival was split into four different challenges in 2017-2018 : the Peer Leadership Conference, Distractology, Coalition Meetings, and the Adventures in Respect Battle. Each school is granted 25 points for completion of a challenge, and the school that finishes with the most points wins Team Rival in its respective bracket. Our SADD students had to rally their peers to participate in activities and online surveys. Milton comfortably beat rivals Braintree and Weymouth and was awarded a $1500.00 scholarship! The SADD group has been talking about bringing in more speakers and student programs for MHS students as well as developing social alternatives for MHS students – Friday night movies, pizza nights, etc, giving MHS students positive and healthy alternatives to help in making best choices as they go through school. As always, the focus for SADD is to promote and build upon our peer to peer support and leadership with positive peer choices to help spread the word. Among those who participated in these challenges are current SADD president Gwyneth Sauter; VP Caitlin Heelen; Treasurer Adriana Ramondi; Conor McAuliffe; Michael Johnson; Milan Smith; Grace Baker; Paula Hogan; Annabel Botsford and Penelope Holland. SADD welcomes newcomers Secretary Sammy Shakeel, Stella Yuan, John McCampbell, Zane Baker-Pozeramo and Sofia Harris. SADD welcomes all new members, and encourages students to come to the next meeting which will be held on Tuesday September 25th. Congratulations to SADD’s students and co-advisors Karen Hughes and Robin Lee on their success with the challenge. Ms. MacCurtain pictured 3rd from right with the Habitats team. 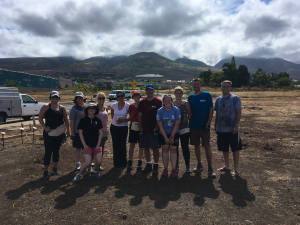 Staff: Erin MacCurtain, Pierce 7th grade guidance counselor, did a build this past summer for Habitats for Humanity in Wailuku and Lahaina Hawaii. The team of 11 built subsidized housing for families in need. This was her second build with Habitats for Humanity and her first one was in Fiji two years ago with a team of 22 volunteers. They built two homes in a small village close to Suva (the capital). She is preparing for another build with Habitats in Thailand this summer. Ms. MacCurtain regularly shares these powerful stories of service with her students at Pierce and we thank her for her commitment both to Habitats and her students. Volunteers: Thank you to MPS parent Julie Ryan who is the Babson Field Hockey Head Coach and runs the youth field hockey program in town. Ms. Ryan donated four field hockey nets to the MHS field hockey program. We are very grateful! Thank you to my blog contributors this week: Michelle Kreuzer, Ellen Lohan, Ben Kelly Jon Redden, Holly Concannon, Karen Spaulding, Elaine McNeil- Girmai, Karen McDavitt, James Jette, Cat DesRoche, Laurie Stilman, AJ Melanson, Noel Vigue, Ryan Madden, Jackie Morgan, Karen Hughes and Robin Lee.